"At the edge of space, patriotism and terrorism are about to cross the line!" Ugh. Another space slog. Have you ever noticed most movies set on a space station are kind of boring? Well, even though it was written by Steve Latshaw of Counter Measures (1999) fame, and directed by Worth Keeter of Unmasking the Idol (1988) fame, this one succumbs to the same fate as their space-sloggy brethren...they're bloody boring. The plot involves a U.N. Space Station (they do nothing on earth but now they do nothing in space!) and a computer disk with the secret to cold fusion. 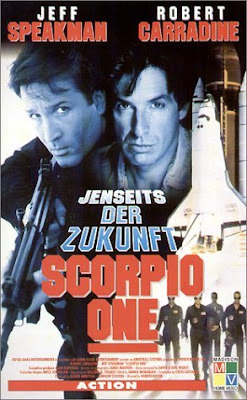 People are dying on the spacecraft "Scorpio One" so CIA agent Stone (The Speakster) goes into space to investigate. He must battle the evil Till (Huff) and save the world. Meanwhile, on earth, the corrupt senator Treadwell (Legault) is up to his old Gary Condit-like tricks, and CIA director Wilfrid (Murdock) is an old salt with a bowtie who is on to him. Will Wilfrid save the day? Will Stone save space...and earth? Who really cares? You might not know it from watching the movie, but Robert Carradine is here too! He's criminally underused. The filmmakers could have gotten any novice actor to play the role of Carter. But his character is not fleshed out at all. It's really a shame to treat Carradine that way. Like with Emmanuelle, Leprechaun, Pinhead and Jason, when a franchise starts to run out of steam, they launch them into space. 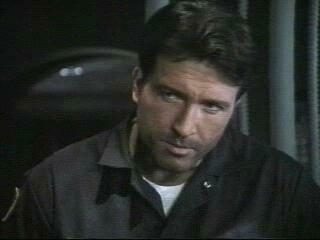 Well, here we have Jeff Speakman in space. While Jeffrey does do some of his trademark moves (here you could call it "space Kenpo"), it's not enough to satisfy the action fan. There is a short scene where he's in Iraq taking on the baddies, but it should have been bigger and a bit longer. Like with Dudikoff and Midnight Ride (1990), viewers want to see their hero beat up the bad guys with aplomb. Here it's a bunch of people wandering around a space station with a lot of talking. See, there's the problem. In place of the characters relating on a human level, they mainly spout scientific space-mumbo jumbo. It's set in the present day, not the future, but the U.N. has a space station and people have laser guns (that are very Q-Zar-esque)? The special effects are pretty funny and there are some very obvious models to represent space stations and rocket ships. It's very 50's in that way. The sets look like they have been used on many Fred Olen Ray/Jim Wynorski productions of this type, and that's quite possible with Latshaw involved. For all the movie's flaws, it's still superior to Falling Fire (1997). The lovable Wilfrid makes the movie much, much better and his presence improves the film immensely. The movie needed more Wilfrid! He should get his own spin-off film. Perhaps Speakman wanted to get out of the beat-em-up roles he's known for. He should stay there.